The Illinois Department of Natural Resources requires one wearable Type I, II, III, or V PFD for each person aboard all vessels. Ensure PFDs are readily accessible. In addition to the above requirement, Illinois boaters are required to carry at least one Type IV (throwable device) PFD aboard any vessel 16 feet or longer (with the exception of canoes and kayaks). A Type V PFD is approved for restricted use and may be substituted for a type I, II or III only when used for the activity specified on the label and must be worn. CHILDREN: All boaters or passengers under 13 years of age must be wearing their PFD while on the deck or in the cockpit of a vessel underway that is less than 26 feet in length. No one under 10 years of age may legally operate any type of motorboat. Persons aged 10 or 11 years may not operate any type of motorboat unless they are supervised by a parent or a guardian, or a competent adult who is at least 18 years old, designated by a parent or a guardian. Any substances which mentally or physically impair a person’s normal functioning. The person convicted has a prior OUI conviction. If the death of a person occurs while the operator is OUI, penalties increase to a class 2 felony. Additionally, if an operator is convicted of OUI while a child under the age of 16 is on the vessel, they will face a mandatory minimum fee of $500, as well as a minimum 5 days community service, in addition to the penalties stated above. By operating a boat or PWC on Illinois waters, you have consented to be tested for alcohol or drugs if requested by a law enforcement official. If you refuse to be tested, you will be subject to suspension of the privilege to operate a watercraft for a minimum of 2 years. The Office of Law Enforcement of the Department of Natural Resources is responsible for regulating the state boating laws of Illinois. 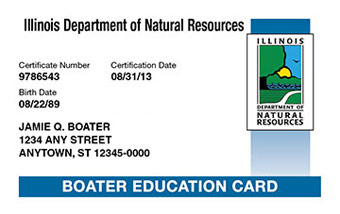 All vessels must have an Illinois certificate of registration and expiration decals to legally operate on public waters in Illinois. A watercraft which has a valid marine document issued by the U.S. Coast Guard, EXCEPT any documented vessel used upon Illinois waters for more than 60 days in a calendar year. Vessels registered in another state and operated on Illinois waters for not more than 60 consecutive days. Vessels owned by the federal government. A watercraft from another country other than the United States temporarily using the waters of the State. Watercraft competing in a race approved by the Department of Natural Resources. *Although canoes and kayaks that do not have a mechanical means of propulsion, and vessels that are federally documented do not have to display the registration number, they are still required to display the registration decal. The certificate of registration indicates the number that must be displayed on the bow of the vessel. The certificate must be kept on board and available for inspection by an enforcement officer whenever the boat or PWC is being operated. The boats registration is valid for a period of three (3) years. All certificates expire on June 15 of the third year. If you change address, you must notify the Department of Natural Resources within 15 days of the change. You must report to the local Department of Natural Resources within 15 days if your boat is destroyed, or transfers ownership. 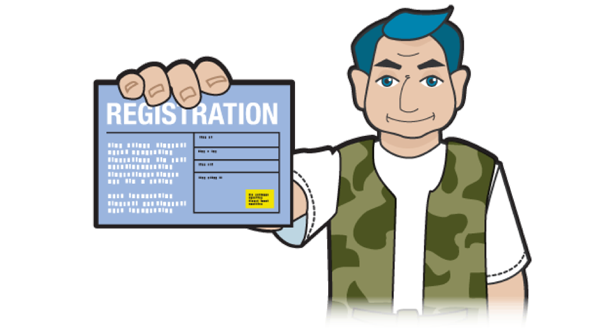 If you lose or destroy your certificate of registration or decal you must apply to the Department of Natural Resources for a duplicate. Successful registration results in a Certificate of Registration, physical boat numbers and a decal. Registration MUST be kept on board the watercraft at all times. For example: IL 1234 BX. This is a federal and state requirement. Decals must be affixed on both sides of the boat, preferably to the right side of and within three inches of the registration number. Decals include the month and year of expiration. Only the current decal may be displayed. Please note that non-powered canoes and kayaks are not required to display registration numbers, they are only required to display decals. See the following table for a list of registration fees. Non-native aquatic species, plants, fish and animals are invading Illinois’ waters. These pests can increase dramatically under the right conditions, displacing native species, clogging waterways, and impacting navigation and recreation. Once introduced, they are nearly impossible to eliminate. Hydrilla, Egeria Densa, water hyacinth and zebra mussels are nuisance species that can be accidentally transported by recreational boaters when caught in propellers, intakes or attached to hulls. Empty bait buckets and remove any plant fragments from bait wells, fishing gear, trailers, dive gear or props. Dispose on land into a garbage receptacle. Drain water from your motor, live wells and bilge. Report new infestation of non-native aquatic species to the U.S. Fish and Wildlife Service. Each person riding on a PWC must wear a U.S. Coast Guard-approved wearable personal flotation device. Recommended PFDs are designed to withstand the impact of hitting the water at high speed. PWCs must either be equipped with an ignition safety switch or have a self-circling feature in case the operator falls off. An operator of a PWC equipped with lanyard-type ignition safety switch must always attach the lanyard to his or her person, clothing, or PFD. It is illegal to operate a PWC while you are under the influence of alcohol or drugs. Operation of a PWC is prohibited between sunset and sunrise. Personal Watercraft (PWC) operators in Illinois must be at least 10 years of age. Persons who are at least 10 years of age but less than 12 must be under direct control of a responsible person who is at least 18 years of age in order to operate. All persons who are at least 12 years of age but less than 18 must either complete a boating safety course and have a Boating Safety Education Certificate, or be accompanied and under the direct control of a responsible person who is eighteen or older, in order to operate a PWC.